A lady asked a question. She asked the question “Can baptism deny you the Kingdom?” Different types of “churches” have varying modes of “baptism.” Some sprinkle, some pour, and some immerse. Some baptize infants; others baptize older children and/or adults. And there are groups which even “baptize” on behalf of those deceased. Then others tell us it is not an important thing and therefore practice no baptism at all. Consequently, history reveals that baptism has been the most divisive issue throughout the present age. Our Baptist forefathers paid dearly for their stand upon the Bible truth of baptism. 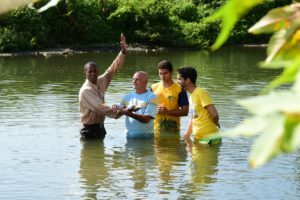 Many focus on the “act” of baptism rather than Salvation itself. Set aside any preconceived notions and see exactly what the Bible teaches. Also, a smart lady ask this question, “can baptism deny you the Kingdom?” I would like to share with you my direct response to her”, and remember to keep the Bible in context as you go along. Also, it is our Christian duty to study God’s Word to show ourselves approved, a workman that needs not be ashamed. Furthermore, you offered a question that many may be confused about, and a very legitimate question. You asked, “Can baptism deny us the kingdom?” Most importantly, the answer is “No.” Non-belief will deny you the kingdom, and nothing else. 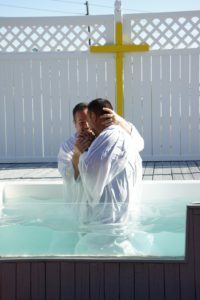 Evidently, many have mistakenly taken Baptism out of context through the centuries by tradition equating it to Salvation. Furthermore you can be baptized a thousand times and all you get is very wet. Baptism is not Salvation. Salvation requires us to believe that. The shed blood of Jesus Christ was the propitiation for our sin. That is what cleanses us, not water. Rather, baptism shows the world we belong to Christ. If anyone has questions on Baptism please contact me and we will show you what the bible says. Thanks. Fishing for men is similar to fishing for fish. You must lure them with the Word of God. Finally, any questions or comments you may have for Bible Buddy, please let me know in the comment section. If we don’t have the answer we will find the answer. Our purpose is to help you any way we can. Bible Buddy has over 20 years of teaching experience along with different approaches for the soul- winning experience. We have seen literally thousands give their life to Christ. We also offer thousands of products and gifts from “The Jerusalem Gift Shop.” There can be a one day delivery for any item. These products come directly from Jerusalem and the town of Bethlehem. Click to visit the store HERE! Thanks and we wish you well! 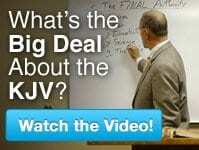 Please watch the video episodes on “What is the big deal about the KJV”, and the custom ministry website video below.